A non-native invasive species of seaweed has been found to have spread to western parts of Scotland. Sargassum muticum, also known as wireweed and which occurs naturally in Japan and China, is thought to have arrived in UK waters in the 1960s. It displaces native species through over-growing and starving them of sunlight. 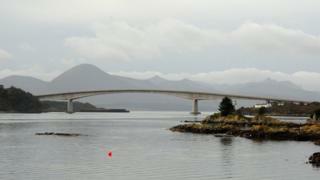 A new report for Scottish Natural Heritage says it can now be found from the Firth of Clyde to Skye. The spread of sargassum muticum is described as the "most noticeable change" to be picked up in the new report detailing a survey of marine biodiversity and climate change. The report said climate change "may facilitate" its further spread, but added that it could be able to extend its range without the aid of warmer temperatures. Sargassum muticum can be spread via its spores being carried from one place to another in ships' ballast water, and by entire "rafts" of the plants floating to new locations.